My friend Derek K. Miller (Penmachine) is gone. Gifted with an amazing clarity of thought, strength of character and courage, and true word wizardry, Derek had the ability to do what I have never seen anyone else do: he wrote his own epitaph. And perfectly worded, perfectly tagged. His writing was perfect, as was his whole being. 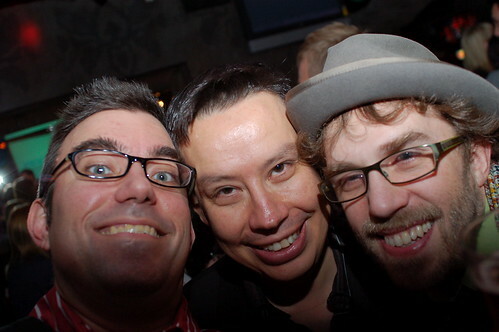 I first met Derek at Northern Voice 2008, when I fully immersed myself in the Vancouver blogging community. I shared with him and his family many a party. 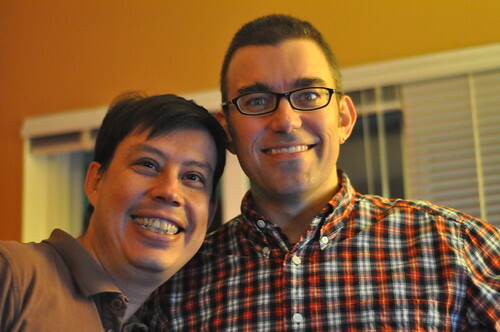 He taught me SO MUCH about photography, podcasting, blogging and more importantly, he taught me about love. His devotion to his wife Airdrie Hislop Miller (whom I am proud to call one of my very best friends) was only matched by his devotion to his daughters Marina, Lauren and his parents, Karl and Hilkka, all of whom I’m proud to know. 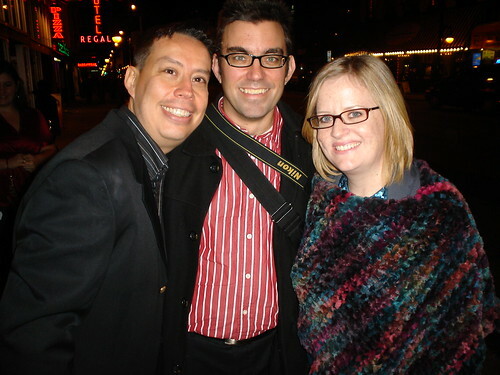 These, these two people (Derek and Airdrie) have been my inspiration for the past 4 years. 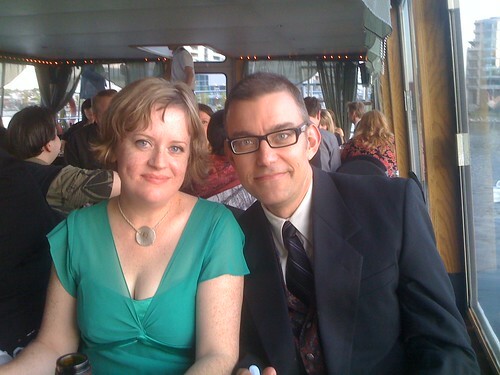 I began co-organizing Mental Health Camp Vancouver with my loved friend Isabella Mori (not surprisingly, also a friend of Derek and Airdrie’s) because of Airdrie, because she organized a panel at Northern Voice 2009. I began taking better care of myself because they both urged me to do so. Derek and Airdrie may very well have saved my life. Even in Derek’s last few months, he reminded me to take care of myself, and to stop doing something, RIGHT THERE AND THEN. Derek and Airdrie reminded me that I needed to live my life, not be consumed by it. And I did. I promised Derek that I would stop pushing myself to the limit, and I have. I have Blogathoned for 3 years in a row (2007, 2008, 2009) for the BC Cancer Foundation in his name. Derek and Airdrie both guest-posted on my blog and their posts remain some of my absolute favorite. Airdrie wrote on her experience as the wife of a cancer patient. Truly an amazing woman. I don’t know how she did it, I don’t know how she does it. All I know is I’m proud of her and honored to be her friend. THIS (the photo below) is such a precious memory in my head (and I remember from Arieanna’s Facebook that it is a precious memory for her. 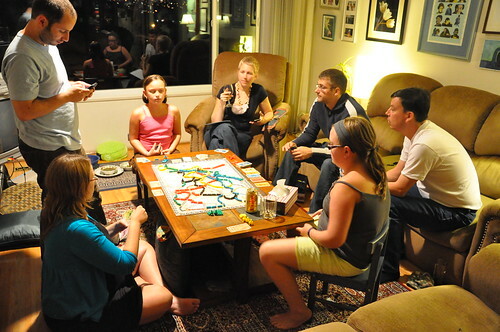 The games nights. When we were just ourselves, a group of friends. No tweetups, no meetups, no social media “scene”. Just a bunch of friends. Bloggers, for the most part, but friends all the way. I can’t stop crying. I haven’t stopped crying since I found out that Derek had passed away. Marking final papers is proving a struggle, but it’s nothing compared to what Derek and Airdrie have gone through, and I can only imagine the pain Derek’s family is feeling. If I’m in deep pain, mine is nothing compared to theirs. Airdrie, you were my best friend and my closest connection. I don’t know what we’d have been like without each other, but I think the world would be a poorer place. I loved you deeply, I loved you, I loved you, I loved you. Rest In Peace, Derek K. Miller aka Penmachine. A friend to many, an inspiration to everyone who has ever read his blog and someone whose life I will honor for the rest of mine, living it to the fullest. Just like Derek did. And I look forward to spending time with Airdrie, Derek’s daughters and his extended family and help them as much as I can as they transition to a life without him in it. The world is a wondrous place, Derek K. Miller, because you were in it. Your legacy lives on. I love you. Derek’s website appears to be overwhelmed with traffic right now. Please read a Google Cache copy here. Derek’s writing is truly inspiring. i hope you take derek’s advice to you to take care of yourself to heart. I love this photo of Derek and Airdrie. Sigh. So saddened today. it’s hard to find words; but then derek has found them so let me try – what i am most struck with right now is the generosity with which both derek and airdrie let us into their lives. which includes his death. derek “took it like a man,” in the best sense of that expression. the world has learned so much from this. he remembered what’s important. may we do the same. *hugs* Derek’s death, even though we all knew it was coming, is difficult. I’m sure you were a wonderful friend to him and I know that you’ll continue to be a wonderful friend to Airdrie and his family. A touching farewell, Raul. I didn’t know Derek, but his impact on those who did is most telling. Derek had that gift: when you spent time with him, you came away somehow wiser in the important things, as if by osmosis. Beautifully written, Raul. I don’t think there are many dry eyed today, even though I only met him once, his journey touched me in a way not many have. Lovely to read your tribute. I was only acquainted with Derek, but benefited from his wisdom in photography, blogging, and, well, his general philosophy. With his passing, a light has gone out in the world. I am really sad too. Thanks for sharing this post. Derek inspired me not to take life for granted. Health is the most important thing, because without it, we can not love or be there for our families and friends. Beautiful tribute. We are all blessed to have had Derek touch our lives in whatever ways he did. Big hugs to you (and Airdrie and the girls and parents). And no going back on your promise to take care of yourself! You mentioned on Twitter about the possibility of a scholarship fund. If that materializes, would you please let us all know? Would love to contribute to his legacy/support his family in whatever way we can. So vulnerably clear, with honesty and sincerity, I met him only once but he touched my soul more than he will ever know. I send much love to Airdrie and his daughters. His energy is vibrating through us all and will settle in all our hearts. Rest in peace friend. Thank you, Raul, for putting raw feelings into an eloquent tribute. Here I go sobbing all over again. …and one more thing… Thank you for getting the word out about his memorial service and the trust for his family.